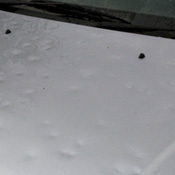 Hail damage is one of the most common issues car owners face. According to the Highway Loss National Data Institute, more than 1.5 million hail damage claims were filed between 2008 and 2014. Oftentimes, hail damage is mild — so mild that in some cases it’s barely noticeable. However, there are instances where golf ball- or even baseball-size hail will strike and wreak havoc on cars. In such cases, windshield and body damage can be extensive, requiring the attention of a qualified repair professional. Unless you really know what you’re doing, attempting to repair hail damage yourself may end up costing you hundreds of dollars and possibly cause further damage to your vehicle. Therefore, hail damage should always be addressed by a professional body shop. They’ll have the necessary tools and experience to safely repair your vehicle. The two most common methods for repairing hail damage are paintless dent repair and using body filler. Paintless dent repair (PDR) is a repair technique that has grown in popularity throughout the years. This method entails using special dent removal tools to effectively push out the dent from underneath the body panel to make it look like new on the outside. An alternative technique is to use a dent puller tool to pull the dent outward to achieve a smooth appearance. Gain access to the underside of the dent by removing the necessary trims. Use a dent removal tool to gently push the dent outward. We offer hail damage removal tools in an assortment of sizes to safely remove dents small and large. PDR can be used on aluminum and steel vehicles if the paint surface is in good condition, meaning it’s not cracked or scratched. In addition, the surface cannot have any torn metal or sharp edges — otherwise, alternative dent repair methods will need to be used. Commonly called by its trademark name “Bondo,” body filler is a substance used to fill in dents or dings. A tried and true solution for dent repair, body filler has been perfected throughout the years thanks to evolving technologies and innovations in the refinish industry. Today’s market offers many types of formulas designed to repair varying degrees of damage, from lightweight body filler for minor dents to heavy-duty filler for extensive damage. To repair dents with body filler, a shop will apply the filler over the dented surface and then sand it to achieve a smooth look. If the damage is particularly severe, a shop may apply a putty over the filler for additional smoothness. The surface is then painted over so that it matches the rest of the vehicle. Clean the dented area with soap and water along with a residue remover. Attempt to remove as much of the dent as possible using various dent removal tools. Sand the dent and surrounding area to remove any paint. Mix the body filler according to its instructions and spread over the dented area. Wait about 20 minutes for the filler to dry (drying times may vary by the brand/type of filler used). Sand the area until it is smooth. Apply putty as needed and wait for it to dry. Sand until smooth and repaint. So, how do body shops decide which method to use? It really depends on how damaged the vehicle is. PDR is ideal for removing small dents caused by hail damage. It’s also much cheaper and more eco-friendly compared to body filler, as there are no chemicals involved. In addition, PDR is a good option if you’re looking to sell your car in the future, as painting and traditional dent repair methods can cause the value of your car to depreciate. Plus, PDR typically is a much faster process compared to body filler. Body filler, on the other hand, is optimal for repairing heavily dented vehicles. 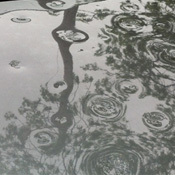 If hail damage has caused the vehicle’s metal to stretch or crack, then it will need to be repaired with body filler. In addition, if hail has damaged your vehicle’s paint, conventional methods will need to be used to repair the damage. The bottom line: PDR is an excellent choice for repairing hail damage, but it may not be the right option for you. If your car has severe damage, you’ll most likely need to have a trusted body shop repair the vehicle with body filler. Be sure to shop around to get an estimate on the cost of repair. Does insurance cover hail damage? It should if you have the right coverage. If you have comprehensive insurance, your insurer should cover the repairs if you’ve met your deductible. Hail and similar damage from natural causes is typically categorized as an “act of God.” Since the situation is out of your control, you’re not responsible for paying for the damage. When does hail damage total a car? There is some misconception surrounding the meaning of the word “totaled.” When a car is totaled, it means that the cost to repair the damage exceeds (or nearly exceeds, in some cases) the car’s value. For example, older vehicles with extensive hail damage are more likely to be totaled than newer cars with mild dents and dings. Whether or not a vehicle is considered totaled is ultimately up to the insurance company. If your car is totaled, you probably have two options: Let the insurance company take it to the scrap yard, or ask for your car back. Keep in mind that your car may still be driveable even if it’s considered “totaled,” especially if most of the damage is purely cosmetic. However, keeping a totaled car is always a risk as there could be underlying damage that’s not visible to the naked eye. The cost and difficulty of hail damage repair depends on the severity of the damage. If you have comprehensive coverage, your insurance should cover the cost of repairs if you’ve met your deductible. For specifics regarding the damage of your vehicle, it’s best to talk with a trusted body shop to get an estimate on the cost of repairs. For more detailed information on how to fix a car dent, be sure to check out our guide to basic dent removal and refinishing.